Looks like the next offerings from Phase and Hassy will be somewhat more affordable, so Thank You Fuji. Most appealing feature is that there's no phone hanging off the back. A beautiful big beast that certainly won't be a take-anywhere camera that although despite of its steep price and given its 100MP MF sensor, it promises the best IQ ever seen. $10K for this camera is a bargain. If you're worried about cosmetics and weight, what about the excellent medium-format film cameras many of us are still using, including the various Hasselblads, Mamiya RZ67 and Pentax 67, among others? (Noting that none of them would win a beauty contest if the criteria were size and weight.) My main concern is the 44x33 mm sensor. I'd be happier to see a 2-1/4 x 2-3/4-inch sensor (nominally but erroneously called 6 x 7 cm) with fewer pixels if it gave us the same or greater tonal range as film. But if this new Fuji really will produce medium-format quality images (again as compared to film), then I'd be happy to sell the children in order to buy it. I don't know how anyone can consider $10K to be expensive, given the current competition in 100MP digital cameras. Expected to be in the region of $10k. Well that's a very harsh competition in the MF arena. The related GF Fujinon's are stellar performers better than anything I've seen in my life - if they can reveal twice as much detail I'm afraid there's not much around that can do the same (unless again, Phase One and Hasselblad H). Technically very, very impressive and innovative. I am a bit amazed that they are not following the lovely retro design and dials of the other models - not a smart move. Personally I'm not fond of menus, and dials are much, much nicer and immediately clear. Anyway, not for me, such a pixelmonster. The last mural I printed is over 30 years ago. I can't wait to try this camera out, I hope that it lives up to expectations. This is one beast of a camera and I mean that in a good way. Can't wait to see the files. I give Fuji a lot of credit; in so many ways they are bringing to the market some really innovative and clever products. This is a trivial comment, but it seems Fujifilm completely abandoned their design aesthetic with this camera. I always regard Fujifilm cameras as being some of the best looking ones out there. 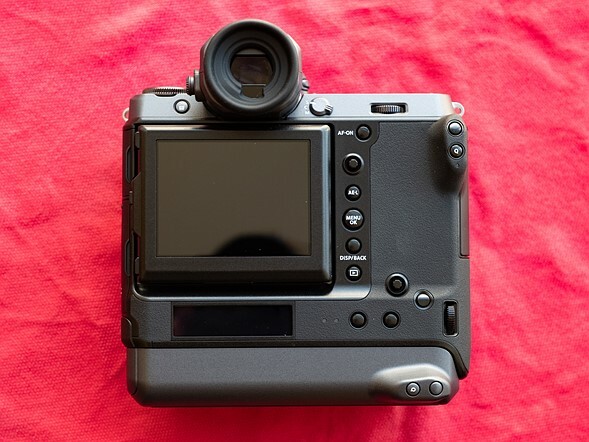 It seems strange that they would abandon the retro yet ergonomic design that Fuji shooters love. But it's not like I'm in the market for this monster anyways. I wondered that too, but on reflection, this is a working tool, aimed at working photographers with little regard for "retro aesthetic appeal." If they are still working on the inside, the outside is not finished. I like it in an old brutalist Sony sort of way. But, it’s all about the handling. the useable DOF due to circle of confusionis going to be pretty tight I imagine. I noticed on the Canon 5DsR that it went from a. highly useable f11 on the 5Dmk2 to f9.5 on the 5DsR, so at 100MP I imagine we'd be at f8. Same "usable DOF" regardless of pixel count. That is, whether the pixel count is 24 MP or 100 MP, for photos of the same scene taken from the same position and same aperture displayed at the same size, the DOFs will be the same. However, when viewing each at 100% (e.g. viewing a 100 MP photo at twice the enlargement of a 24 MP photo), the DOFs will be different. But not when viewing the photos at the same size with the same viewing conditions. Original poster is referring to diffraction due to the smaller pixel sizes. He isn't really talking about DOF in the traditional sense. I am not sure the diffraction limit on this new sensor or size. Usually there are ways to overcome it; especially landscape users who tend to shoot at small apertures anyways. Same deal with diffraction: 100 MP doesn't suffer any more from diffraction than does 24 MP. Display a 100 MP photo and 24 MP photo at the same size and the 100 MP photo will be more detailed regardless of the aperture (all else equal, to include the aperture, of course). The devil's always in the details--for sure. You are right that if you take a 100 MP and resize the image down to 24 MP, you won't notice any issues with diffraction. But if you keep the same native size of both and shoot at f11, the 24MP will be sharper. It isn't about resizing the 100 MP image. It is about what is the smallest aperture you can use with a 100 MP sensor before sharpness starts to decline. Usually the applications with large pixel count sensors is to print big. To me it is all academic though. If you need to shoot at f22 as the shot dictates you do it (and suffer the loss of sharpness). Most of these things us 'normals' don't really care about. I was just clarifying the original poster was referring to diffraction limits on larger sensors rather than DOF. I'm just saying to display the photos at the same size, whether that involves downsampling the 100 MP photo or upsampling the 24 MP photo. All else equal, the 100 MP photo will come out on top, being no worse for wear with regards to DOF or diffraction. Anyone know if its actually a proper 16bit pipeline, sensor through output? Detailed specs like that are still unconfirmed. We'll have to wait a little while before those things firm up / are made public. Too big, too heavy, too bulky and without many of the wonderful knobs and buttons that define Fuji. Great camera, but I have one worry: When comparing images with other cameras the images where quite close. Maybe the Fuji is a bit better here. But I wonder how the imminent next sensor generation will compare. SonyRiv will be out some time this year. That will be interesting to watch. The look of all the Fuji MF cameras. i hope it has bluetooth so i can upload directly to my IG acount. the baseplate should have had an accratech molded bottom for direct mounting to Gitzo/RRS tripod heads. Using this machine w/o a tripod is ridiculous. Or you can attack it to a camera system that is always on a stand. That’s how my GFX works. No need for a tripod. I wonder if IBIS will properly address the challenge of handholding 100mp. I wouldnt think it to be a mitigation. Not a solution. A big, ugly brute of a camera. They say it has the same heft as a D5 but somehow I doubt it because all the hands holding are just that...hands, plural, whereas one could easily hold a D5 with one hand. Surely it will have terrific IQ for the few that need it (not want it) and from my perspective, the Fuji lenses are terrific and better than the Phase 1 or Hassy but with similar photosite density to a 50MP FF the only real advantage is greater sampling, not DR. or high ISO performance. This is so big that it warps the very fabric of space and time around it. So you mean it might actually look nice?! I think its looks are wonderful; real workmanlike! Otherworldly feat of technology, this must offer IQ levels we couldn't even dream just a few years ago. The thing I get sad about is it's all essentially wasted. It falls in the who cares domain at this point in time. 99% of amateurs who can afford it will waste all this horse power in mundane shots that could very well be served with 10 mp APS-C cameras. Before you get absurdly offended, let's be honest: 100mp is not for me or you. It's for extremely careful landscape or fine art, and high production value fashion and commercial photography. Everything else will hardly ever need or *DESERVE* 100mp. And pros are starving. I know that side of the fence very well. Long gone are the days when the notion of 100mp would give you any commercial advantage over the next guy. Clients don't give a flying F what you shoot, how many MPs, etc. Any 40mp DB is already enough for a selling argument. If it's in the budget, who cares? Maybe a person wants to shoot picture of his cat with a really neat camera and has the money to afford it. Wasted? On who? I hope Fuji sells a ton of them. I only wish that I had a photo piggy bank full enough to afford one. I'd be first in line. We all have different rules we live our lives. Personally I only feel comfortable spending money on high end gear IF my photography is worthy of the upgrade. That rule applies even if I do have the budget. I've been retired from pro activities since 2014 (shot fashion professionally for almost a decade). Back in the pro days, I shot with a 22mp Mamiya (paid $ 26 grand in my Country's currency when new). If I ever go back to pro activities, I'll buy a new DB on day 1, but only IF I become a pro again. No reason to buy amazing gear just for mundane photography. There must be a clear reason for the added horse power. At least that's my POV. Obviously less than 1% of the people on this forum will agree, I'm aware of that. And it's wise that you live by your rules. My rule says to buy the best you can afford. Doesn't make your rule or my rule right or wrong. This camera isn’t meant for the majority of the people that frequent sites like DP Review. It’s primarily for commercial and landscape photographers. I still print large landscape prints (i.e., 20x30 and greater) for “home decor” decorating. It’s a smaller marker but one where people are still willing to pay for large high quality prints. There are still parts of the industry that don’t revolve around shots taken with an iPhone posted on Twitter. Landscapers will probably need a sherpa. What's the dimensions of this sensor compared to the sensor that's in the GFX 50S? Diffraction should start quite early on those tiny photons. Fortunately, good macro lenses are sharpest wide open. They’re all I use. I'll write a review of this camera if DPR forks over 10k for the body and a few more k's for a couple of lenses. After all, I'll need to review thoroughly, and stuff. Wow this must be a very good camera.....A lot friends said that to me. Now if i only can afford one i will proud. Most images today are review on a 72 dpi computer screen or smart phone. So.....? I am sure you meant ppi. My monitor is 138 ppi. A 27" 4k monitor is 168 ppi. This camera is obviously not meant for the applications you are suggesting. It is not meant for most photographers. So stick with your phone camera then? Another expensive piece of equipment for the masses for whom they can't even make a living with it. Who wants to make a living doing that? I can think of at least 50 better ways to make a living. Another great camera for shooting cat/puppy portraits...not to forget soccer moms! For me this Camera is a vulgar display of awesomeness. The size alone will allow wedding shooters to charge more. And the paying customers seeing how the camera is larger than their cousins D-7000 DSLR will feel better about paying the higher cost for prints. This is something I’ve never understood. Why a “big camera” means you can charge more. Most wedding clients never see the camera until wedding day. But they do their homework on the style of the photographer before interviewing them. If you say “I charge $X because I have camera Y, you’re just opening the opportunity for them to ask for a discount if I use “lesser” camera. It's not the main factor, and for some clients not at all. But some people definitely notice the state of your equipment, just like they notice the quality of your website, state of your studio, the way you dress, etc... There are times when your camera gets you noticed and you want that, and other times when you don't. I'm currently building an illuminated dry cabinet for our new studio. Translucent shelving, glass doors, back illuminated, everything inside it looks like a 3D close cut image. Some of the stuff is just sentimental - my dad's old Nikons - the rest is stuff we use. It's basically an equipment wall, but one that's both aesthetic and functional. Why not? Let's people know we're super organized, care about how things look, and that we use high end equipment. Definitely yes in some cases. The huge amount of data recorded with a bigger sensor makes it easier to recover highlights, shadows and allows for more effective sharpening. Try to recover highlights from a fireworks shot with a full frame camera. No problem with even the cheapest Hassy, the X1D. I used to process 57 mpx files on a mac pro about 6 years ago. I think computers have improved since then. Guys, the body itself has probably little to do with the final version, it's easy to see that's a mockup, i can't believe that the screen will be like this looks like a very old canon camera. I don't think more conclusions than a full body can be made of the body. I'm interested on the EVF, though i really wanted it to be as good as the new panasonic offerings. They are talking about a June 2019 release. Yea... this is close to the final camera. Now if this would cost like max 5000 bucks things would start to get interesting. Camera prices today are ridiculous and will only speed up the inevitable death of the camera industry as we know it. Economics 101. Go to any youth sports event or any gathering where people are taking pictures. How many interchangeable lens cameras are there? 1? 2? It has been that way forever. True and false. False because the quality of optics and sensors is now such that image quality is excellent without needing medium format. Medium format digital is essentially aimed at commercial photography for big enlargements and there is a money to be made in that segment. For all other applications not requiring big prints, smaller format are just fine, explains the quantities sold of those medium format models, hence the high price. True because no one wants to pay forward to cope with market changes, as a result they pay backwards (the market gets smaller as a result of increasing prices). Wrong. The camera industry's survival does not depend on whether a $10K camera can be sold at $5K. It depends on whether the $300 ILC can differentiate themselves from camera phones. Do camera phones offer 300mm f2.8 lenses? Where did you see that an ILC with tele lens is replaced by a phone? Technical feats and IBIS - impressive. I wonder if this camera should be hardwire to a tripod to ever achieve what a 100MP sensor can do. That's the reason few pros minded the size of MF bodies. It's for anyone willing to pay for it...silly. You can take a sharp picture with any camera handheld as long as you can achieve a fast speed, even better if using fast lights in a studio. Tripod is better but sometimes gets in the way. It's amazing how people whine these days. Ego after ego. It's amazing how people judge a priori, beforehand, with full prejudice, complete negativity; lots of personal prejudice and subjectivity; just read the comments below; sickening really. Nothing much of real value to see here. Yes, you are right. Experience showed that customer behavior derail when they don't have need. Offering great camera equipment to already satisfied customers is like offering a great treatment to healthy people, they are going to invent excuses why what you offer doesn't suit them. I've been trying to sell products in completely saturated market, objections were complete rubbish and not matter how you demonstrated why objections weren't valid, the customers would never buy anyway, simply because they had no pain (no need). I moved efforts to a different market, from Day1 I achieved massive success, that was a that time I realized that patients must have pain as a condition for them to open up to new offerings. Also, when someone cannot sell something on ebay, etc., when they lower the price, people often think it's was really a piece of junk to begin with. A new listing with a higher price will often sell! People think it's better/more valuable/desirable because and they gladly pay for it! In today's world people are not selling stuff, but are selling the idea behind it; it's a mind game, and if played right, will spell either success/failure. Re: this 100MP camera: unless you make ginormous prints, it's overkill. Funny thing is that many people don't print anymore, only share over the internet, but still buy FF frame over 40MP cameras or APS at 24MP. Why? Pixel peeping has become the new joy of photography. Really weird. I must be a rare breed; I print tons from 5x7 to 17x51. And will send out for 24x36. All done from a Sigma SD1M or SDQ. This Fuji 100MP is for prints way beyond that. I don't give a hoot how it looks, as long as it performs. How on earth is anyone supposed to make phone calls on that? yes it has all that normal stuff, and no X-TRANS. BTW: Quote: "At the heart of the GFX 100 is a newly developed 100MP BSI CMOS sensor, which at a component level we understand is similar to the sensor used in the X-T3 ." Larger sensors are made by stitching together smaller sensors. So is it an X-Trans type sensor? Similar sensor tech as used in the X-T3 (which is different to the X-T2), but obviously a different CFA. ...yes you can only make a sensor of a limited size on silicon, most sensors are made up of smaller 'sensors' joined together. Not sure how deep you what to get here, but in the early days of digital you could see this stitching in your photos - as 'tiles' with ragged edges between to disguise the join, it's less apparent these days, though it can still be seen by us guys who look closely into what's behind the curtain. Maybe I shouldn't have mentioned this, dream on, you can make a sensor of any size in one single piece etc!! ...quite so, alignment and meshing (to disguise the join) is now far better than is used to be. Certainly not some guy with a glue gun and a box of finished small sensors! The price is a major feature. Anyway, I read a lot of comments here, most of it shows that the customer base at dpreview is more representation of the micro 4/3 , apsc and full frame market, hence a lot of comments are irrelevant once looking at them from a medium format / commercial photographer standpoint. That's too bad. We need some real professionals here to educate the ignorant herd and tell them that the size does matter. While the fancy F-number on a tiny overpriced lens doesn't. Because, for a fully developed photographer, it is all about the image and the potential of the tools that allow to get that shot in high definition. Not about tactile fetishes, retro nostalgic hipster looks and other artsy nonsense. Unfortunately, this 44x33 pseudo-medium format doesn't really make much of a difference compared to full frame. Maybe that's the reason why MF folks are having conversations elsewhere. Honestly, the real MF cameras are not even listed on DPR website. Great spec for MF digital camera, despite the retro 80s Minolta MAXXUM look of the thing. But it really should of incorporated at least one CFexpress slot from the get go and larger buttons would of been nice too, there’s plenty of room for them! Even though I still believe Fuji is sticking with MF just to be different. For most situations, standard FF would of been just as good or better (faster lenses, sports photography) still, quite excited for this release. No, C.F. express is just another stupid waste of money along the way to the junk yard of memory cards. UHS-II is king, and any company that puts anything else in a camera is just forcing people to waste their money on cards that will soon be obsolete. Will it come in silver?? Can someone explain me why almost no major camera maker doesn't make the vertical grip ergonomics same as the main grip? Quite the double negative there buddy. Pseudo your meer intellectual presence just made DPRs server fun faster - I am near certain. It looks less refined and screams prototype. I hope Fuji will continue to improve the design of this camera! Why is it so different from the 50mp GFX body? I suppose the logic behind the tiny LCD screen is this is 99% shot tethered so the screen size is not a big deal?? The screen isn't small. The camera is big! Well, it's a camera, not an iPad. If you got an iPad that weighs as much as this camera, you wouldn't be satisfied either. What part of "first working prototype" didn't you understand? Why still the micro-MF sensor size? I thought they would have gone up a notch to proper MF size, in order to get good quality. It's disappointing, but probably driven by the need to fit their existing range of micro-MF lenses. Tail wagging the dog, I suppose. They can make a "full-frame" MF next time. It has a huge sensor compared to 35mm. Why are people hung up on the terms full frame and 35mm. TN Args: Because a "full frame" medium format sensor is even more expensive to produce. no, sony shouldn't make their own MF. they should keep selling sensors to others which is a bigger profit. while keep pushing the limit of 135FF which is much more balance and practical for consumers market. It is Full Frame in relation to its lenses, in the same way a Canon 5D sensor is full frame in relation to 135 lenses and a Pentax K3 is full frame in relation to APS lenses. For this Fuji there aren’t any lenses that are available that were designed for a bigger sensor. how in hell the brand than makes the X3T came up with this body????? I guess I'll be dead by the time MF digital will get somewhat closer to the price of MF film. Yep, I know the current cost of film and processing and the hassle but looks like FF digital will suffice and spend what ever I have on travel and taking pics than MF. I still have a freezer full of 5x7 Velvia should I get the craving again. That thing from Fuji is "fake" MF, 33x44 is fractionally bigger than 35mm and only gives you 2/3 EV over it... but with slower lenses so you have less control over DOF than with 35mm but at a higher price. There is no fake Medium Format size. Just like with film, there were many sizes. It is equally as stupid to say 645 is fake because 6x7 or 6x9 is real. Medium format just means bigger than 35mm. And it appears some here really dislike the fact that their 35mm full frame is smaller than the Fuji. 33x44 sensor has 1.68 times the area of a 36x24 sensor, so that’s your 1.5 stops. 645 film has 3x the area of a 135 sensor, but sensor technology can operate at much higher ISO than film so the comparison is pointless. Tiny buttons on a huge camera, so much spaces wasted. and that's a terrible vertical grip too! Nice job, Fujifilm but who cares? they got good colors anyway. So you tried the grip? Clever boy! no but I don't think it's comfortable to hold. they should add some curve for shape of fingers and add leather for more grip. but not completely flat. Maybe you should try it before going into exclamation marks territory? Do you think the grip is similar, in feel, to a Leica SL’s, or an A7 RIII’s l?